Dr Dinah Eastop and Dr Mary Brooks (Durham University), Honorary Research Fellows with the Centre for Textile Conservation and Technical Art History, supplied this image from the recent conference in Hong Kong. TCC and CTC alumni gather, with Marion Kite (Conservator Emerita at the V&A) and Teresa Heady (Senior Objects Conservator, St Paul’s Cathedral), at the ‘Unroll and Unfold: Preserving Textiles and Thangkas to Last’ symposium in Hong Kong organised by The Palace Museum Beijing, the International Institute for Conservation (IIC) and the Cultural Services Department of the Government of the Hong Special Administrative Region (24-25 November 2017). 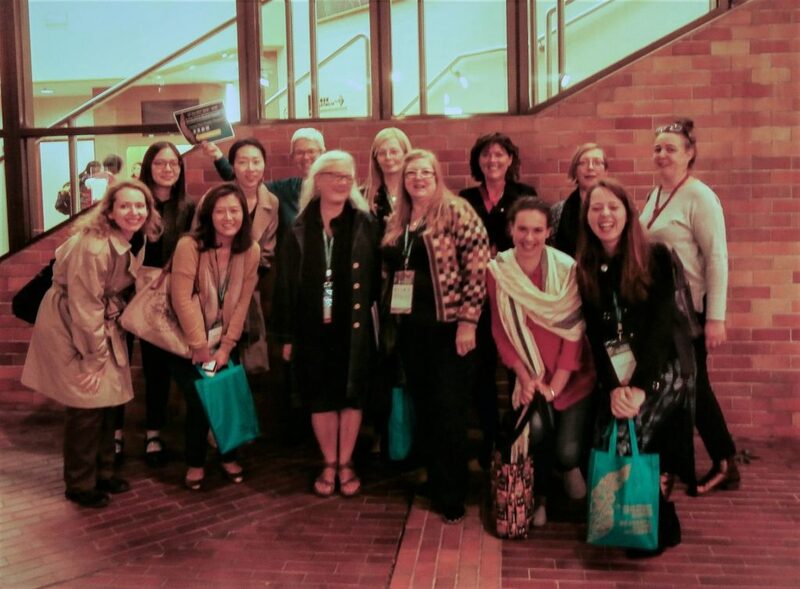 Those present include Christina Margariti (now based in Denmark); Kate Blair; Sung Im Hyun (based in Qatar); Miki Komatsu (based in Singapore); Dinah Eastop; Karen Horton; Tess Roberts (based in Australia); Mary M. Brooks; Hannah Vickers and Monique Pullan. I was there as well but missed the photo session! What a marvellous photo, the name Mary Brooks and Dinah Eastop rings masses of bells but it is a long time since we met so I cant pin a face to them! I so enjoy all these Posts, many thanks for keeping us on the list! What a shame you missed the photo opportunity, – if I was better with technology I would offer to photoshop you in! What a joy to see your all on this picture!